The comprehensive Fly Fishing School conducted each winter by the Spokane Fly Fishers will begin Feb. 20 with weekly indoor classes and outdoor casting sessions into April. Sign up: spokaneflyfishers.com. There’s no off-season for serious anglers, and that includes winter. Some open streams are unusually low, clear or uncrowded during winter. Some lakes, such as Hog Canyon, have winter-only seasons. No expensive boats are required to reach honey holes in lakes that are safely capped with ice. No wakeboards, inner tubes or mosquitoes must be endured. It’s easy to keep the catch cool and firm for the table. A sampling of the many winter fisheries in the Inland Northwest is presented every Thursday in The Spokesman-Review’s Hunting-Fishing Report by Alan Liere. Three of those waters – Curlew Lake, Rocky Ford Creek and Lake Roosevelt – illustrate the wealth of cold attractions that are hot right now. Curlew Lake is luring ice fishers from far and wide to Ferry County just north of Republic with a poorly kept secret that the waters are infested with yellow perch. The panfish are peaking after an illegal introduction around 2010. Bill Baker, Washington Department of Fish and Wildlife, has caught bucket loads of the perch, and he encourages anglers to do the same. Get them while they’re big – up to 14 inches – and before they overpopulate and stunt, fish biologists say. There’s no limit on the perch. Anglers from the Seattle area, Wenatchee, Spokane and other distant towns have been joining locals on the lake in recent years to tap the bounty of good-eating panfish. Tiffany’s Resort posted Facebook photos of 5-gallon buckets filled with big perch caught in front of their cabins on Jan. 25. On Monday, the perch seemed to be off the bite, leaving anglers to catch mostly rainbow trout. Rick Mumford of Malo parked at the Curlew Lake State Park lot (Washington Discover Pass required) and hiked out onto the lake south of Wiseman’s Island. He caught a five-fish limit of trout in less than 2 hours. Baker says die-hard perch anglers never fish a hole more than 15 minutes or so if they’re not getting bites. They keep moving, augering new holes, until they find them. Baker said the best perch fishing at Curlew is in December and into February, but the fish tend to go into a prespawn mode and are tougher to catch starting in mid-February. The beauty of having a productive ice fishing lake was in display that afternoon after classes were out at Republic High School. Three boys almost jogged out onto the ice and quickly drilled three holes and dropped their lines. Cadin Lightfoot, a freshman, quickly hooked the first trout and handed it to Mason Haman, a senior, who slapped the fish on a pan over a backpacking stove and fried it up for a snack as the young anglers continued to fish. “We’re just getting in some fishing during the break we have before basketball practice,” said Gabe Lightfoot, a junior. “We’re a lot better at fishing than at basketball,” Haman said, as Cadin hauled another trout out of his hole on a lime green Glo-Hook. His successful technique is to drop the jig to the bottom and slowly retrieve it up the water column. “We’ll release the rest of the trout, but we’ll keep any perch we catch. They’re especially good,” Haman said. Rocky Ford Creek, on the other hand, lures scores of anglers during winter simply for the chilly thrill of the catch. The spring creek 20 miles north of Moses Lake is stocked from Trout Lodge Fish Hatchery and sports fish from 12 to well over 20 inches long. The stream is open only to fly fishing, and all trout must be released. The challenge is to dupe well-educated lunkers in the 1 1/2 miles of stream between the two Trout Lodge hatcheries. The clear water steams from the ground at 52 degrees and flows slowly through the sage desert. Higher flows related to irrigation and scorching hot summers make late fall through winter prime time to fish Rocky Ford, said Darc Knobel of The Desert Fly Angler shop in nearby Ephrata. The best fishing is in November and December before nearly all of the trout have had an experience with an angler’s hook, he said. 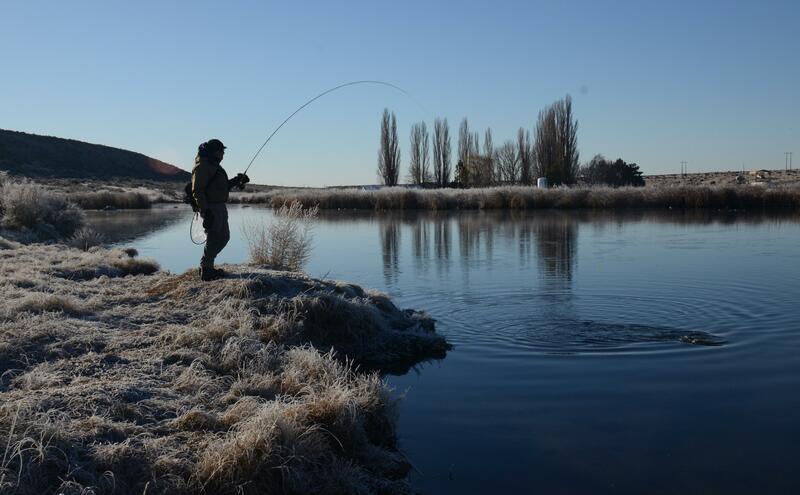 As it was one day last week, when the temperature was 22 degrees as the morning sunshine reached the water on a clear, wind-free day ideal for spotting and stalking big trout. “I live for days like this on Rocky Ford,” said Don Childress, who’s caught and released trout to 10 pounds on Rocky Ford. Knobel offered some basic advice for fly fishers headed to this Grant County gem. Expect lots of company from Western Washington on nice weekends. Use fluoro tippet, which is stronger but less visible than monofilament and less likely to spook the wary trout. Carry 4X, 5X and 6X. Scud patterns in the Size 18-20 range take more trout than any other pattern in Rocky Ford. That said, anglers also have good days drifting patterns such as midge pupae and bloodworms and stripping leeches (especially in low light). If you use an indicator (bobber), use the smallest that will float your fly and still be seen. Childress, an experienced globetrotting fly fisher, was fishing a scud without an indicator. The tiny scud pattern was difficult to see as he drifted it downstream to trout he’d spotted feeding. He would gently lift his rod when a movement of the fish’s head or mouth indicated it was time to set the hook. Misses were common. Knobel said anglers often are wasting their time if they cast too many times to a trout’s refusal. “You’re better off moving on to another fish,” he said. But every rule has an exception. “I must have cast to that trout 40 times before I hooked it,” Childress said. By not having an indicator, he was able to run the fly past a big rainbow without spooking it from above. He also could retrieve the tiny fly for the next cast without creating the fish-spooking wake an indicator can make on glassy water if retrieved too quickly. Meanwhile, an angler downstream was putting on a clinic of fast stripping a streamer, hooking about five rainbows in 90 minutes. “A lot of it is just a matter of having the touch,” Knobel said. I was having my best luck casting beyond obvious fish to target trout at midstream or beyond that revealed themselves only with the occasional flash of a light-colored belly as they fed. Members of a Spokane fly-fishing club preach a rule of thumb to set the indicator a bit more than an arm’s length above the fly. Lake Roosevelt offers 125 miles of year-round fishing water upstream from Grand Coulee Dam that rarely freezes. It produces bass, burbot and walleyes and zooplankton-fed rainbows that are among the tastiest trout anywhere. While rules require wild redband trout to be released, the lake has a good population of fin-clipped fish that are raised by the hundreds of thousands in net pens before being released in early summer. By December, these hatchery fish are big, wide and delicious. Boaters trolling Rapalas and other lures have the advantage in finding fish at Lake Roosevelt, but bank anglers can walk up or down the shoreline from designated access points such as Seven Bays and find coves or shelves to cast to with good results. Dave Ross of Spokane Valley endured temps in the teens to catch four trout on Wednesday morning. He was dipping his rod in the water before each cast to thaw the rod guides and flinging a slip-sinker rig baited with two or three minnie marshmallows and a piece of worm. “The fish all pretty nice, and that 4-pounder will feed a family,” he said, poking a little fun at his partner, Jim Kujala, who caught the biggest fish on their previous outing. Published: Feb. 4, 2019, 6 a.m.